As conflicts spread, galactic prestige becomes all-important, both to extract concessions and to fend off attackers. Meanwhile, the Alien departure point is located and the Uplift Overseers arise. Can you build the most prosperous and powerful space empire in a galaxy on the brink of total war? This expansion adds new start worlds, goals, game cards, and rules for galactic prestige to Race for the Galaxy and its first two expansions, The Gathering Storm and Rebel vs Imperium. New solitaire game counters and drafting rules for six players are also provided. 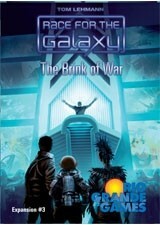 Other products in the "Race for the Galaxy" series.